Santa Fe TTN is the only New Mexico TTN chapter and welcomes all New Mexico residents and visitors. 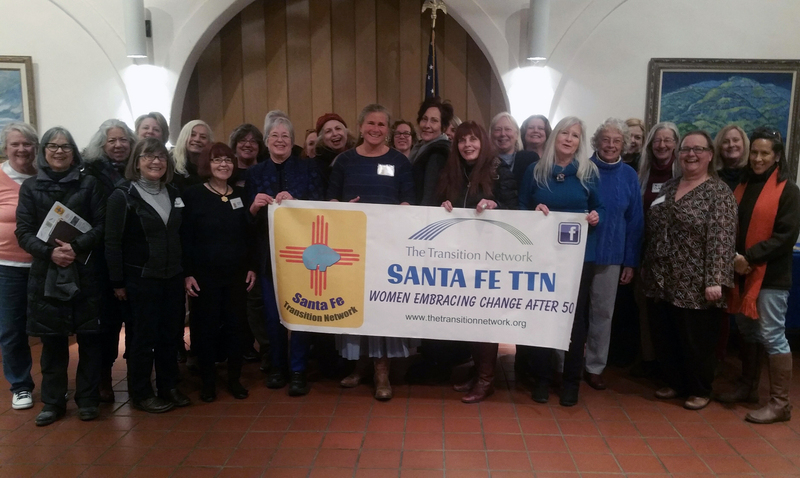 The Santa Fe Chapter of The Transition Network is a vibrant community of powerful and inspiring women. We have transition peer groups and special events for members, and a monthly program that is open to members and non-members alike. To find out more about our chapter, or to get on our mailing list, please email santafechapter@thetransitionnetwork.com, or check out our upcoming programs and events. We thank you for your interest, and look forward to meeting you! Monthly meetings take place on the Fourth Monday of each month; when TTN women gather to socialize, welcome new members, and find out what's happening in the chapter. There are also special events and peer groups to join. Visit our Events and Peer Groups pages for more details and to register. MEMBERSHIP: National/chapter fees are $100 a year and $190 for two years. Scholarships are available. Contact Member Services at info@thetransitionnetwork.org. Scholarship recipients are confidential and chapters are not informed. Click here for a TTN membership application form to print out and mail in or give to membership chair, Judy Donohue at a monthly meeting. You can also register using this national chapter website and a credit card. Click here to join or use the header above and follow instructions. Bringing Holiday Spirit to the Residents of Casa Real! Who Doesn't Love Ted Talks?! We gathered in Sue Benedict's sunny kitchen and piled in two cars for the ride to Albuquerque, talking the whole way- laughing, telling stories, getting to know each other. The tickets we purchased said "Flight #18" and that's what it was! We lifted off the ground and went 2 miles straight up, up, up, over the canyon below us, above the 3 story high rocks, over the first tower, and across the great gaping open space. We were holding on for dear life, thrilled and terrified both. At the top it was windy and brisk. The views were liberating, expansive, and vast. Following a scenic potluck tailgate party, TTN members and guests enjoyed a series of arias from this season's operas presented by the Santa Fe Opera's Apprentice Showcase featuring singing and technical apprentices. TTN members traveled to El Rancho de las Golondrinas on August 5th for their New Mexican Food Fest. A tour of artwork created locally and internationally was enjoyed by several of our members and guests during the Opening Night Preview Party on July 13th of Art Santa Fe, an annual 3-day exhibit at the Santa Fe Convention Center. There were opportunities to speak with the artists and attend demonstrations and panel discussions. On July 8th, 5 women drove to Abiquiu for lunch at the Abiquiu Inn and to tour the events at the annual Lavender Farm Festival, also in Abiquiu. Women in Transition Workshop a Success! Eleven women, TTN members and non-members, attended the Women in Transition workshop on June 24. Jean Palmer and Ginny Dwyer were the facilitators. The women learned about the three phases of transitions, how to navigate those more successfully and worked on an action plan for themselves. On May 17th , Jean Palmer's living room was transformed into a bit of a concert hall with melodies rivaling the best of the songbirds nesting on her portale! Building Camaraderie - As Well As Walls! Our Fifth Anniversary Party — The Best Ever! On February 22nd, six TTN members gathered on Museum Hill looking forward to a private tour of the Museum of Indian Arts and Culture to be led by Kay Henriksen, a docent at the museum and also treasurer of our TTN chapter. Alas, a gas leak at the museum forced the building to be evacuated, cancelling our visit! Luckily the hill offers several alternatives and the group quickly chose to explore the nearby Museum of International Folk Art instead. Women's March on Washington, Santa Fe Style! Hikers Mesmerized by Art on the Rocks! Members Viewed Native American Art in Santa Fe Collection! WOMEN IN TRANSITION WORKSHOP: Finding Insights & New Directions! The Santa Fe Opera Up Close! Discovering Mabel Dodge Luhan in Taos!! Our March Meeting Served It's Purpose! Getting to Know Each Other at a Special Tea! Book Swap & The Joys of Literacy!